The early 991 cab in guards at 911 v ??? I honestly don't know for sure what my next Porsche will be but it will definitely be a 6 cylinder coupe with at least 320 bhp. Just trying to help you choose! I think you are mad to sell this car! It is stunning! But is is your decision and I am intrigued to see what you end up with. lovely car and colour. very rare combo. good luck with the sale terry. Funnily enough, purely for research purposes, I'd actually booked to view that car but bad weather put me off. It hasn't got Sports Chrono or paddles and I don't like the sunroof on the 991. It's also a fair bit more than I'm wanting to spend. It is my second favourite colour though. Part of me agrees with you Ben but after 7 fantastic Euro-Tours including 4 x Dinslakens, 3 visits to Nurburg/Eifel Forest plus 1 each to Stuttgart, the B500/Black Forest and Spa as well as numerous repeat visits to major UK events it's simply time for a change. Also, family circumstances mean that in future the missus is more likely to accompany me and she's always found the performance of the Turbo too raw and the ride a bit too sporty. I'll miss the torque and outright shove that 'Red' has in abundance but my days of airfield strips, track days and 175mph+ on the autobahns are behind me. NB: Disclaimer . For the record, 'Red' has only done 6 x airfield style runs and a few slow laps of race circuits in my ownership. She did help me to my own PB of 177 in Germany (without her breaking sweat) but since then I've found 165 to be my personal 'bottle' thresh-hold. And it is now reserved! Right - narrowing down on the price now too and some of the extras.. back on the trail! Many happy miles in convoy on the Dinslaken, Spa, Donington trips with “Red”. A red gen1 991 coupe , no sunroof , with your T8 number plate will be a worthy replacement. I’m now going to scour the ads till we find a good’un. GLWTS, it a fair price I think . Hopefully Hannah will retweet it to her 4,164 followers on twitter . Nope. After my long time in a 997 the only one I'd ever consider is a Gen2 Turbo and they're waaaaaayyyyyy too expensive. Askgeez is definitely barking up the right tree. My car will not be part-exchanged or sold outright to a dealer. Lovely car Terry and owned by a true enthusiast. 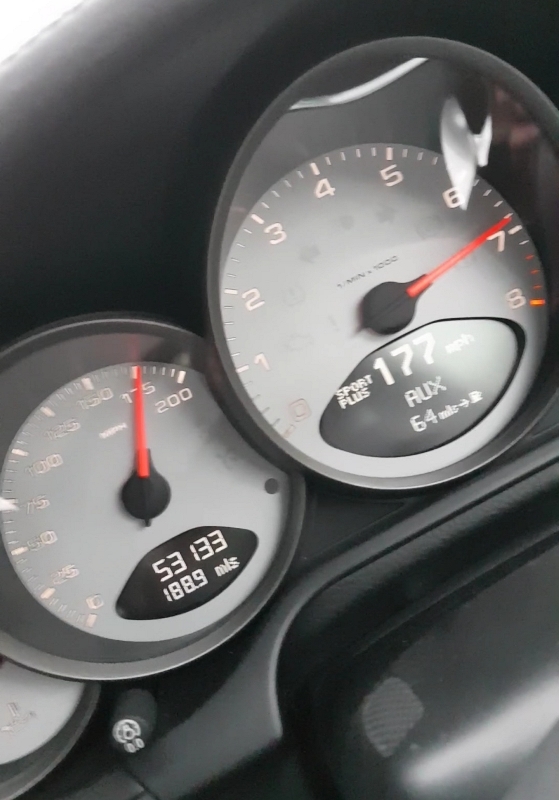 Coincidentally my PB is also 177mph (in Germany too... obviously), just goes to prove you don't need turbos to get there!